Rain Dial Repair. Stuck buttons. Unresponsive buttons. Rain Dial Repair. Short Battery Life. Stuck buttons. Unresponsive buttons. Short Battery Life. 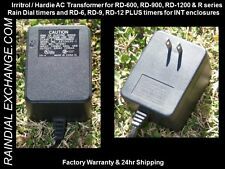 All electrical components will be replaced with above OEM standard parts. Short Battery Life. All electrical components will be replaced with above OEM standard parts. Unresponsive buttons. Rain Dial Repair. Fix These Issues Broken/missing turn knobs or plastic buttons (Stuck/unresponsive buttons are okay). 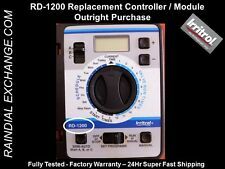 RD-1200-R REPAIR SERVICE. Stuck buttons. Model A5724125-1. Output: 24VAC 1250mA. Input: 120VAC 60Hz 38W. 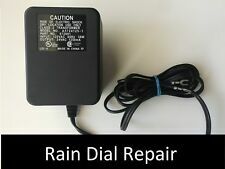 Irritrol RS1000 Wireless Rain Sensor. Condition is Used. Shipped with USPS First Class Package. New in the box, Irritrol RD600-EXT-R. This is for the case only. Tested working, any questions please ask! New in the box - allows for sensing rain and automatically adjusting irrigation schedule. 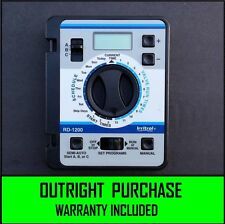 Irritrol Total Control TC-24EX-B (24)Station Irrigation Controller. SHIPS FAST!! Controller Is Guaranteed! GREAT VALUE! You will only receive what you see in these two photos. 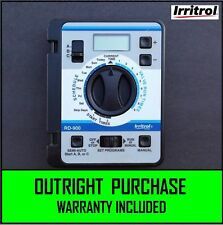 Irritrol Total Control TC-15EX-B (15)Station Irrigation Controller. SHIPS FAST!! 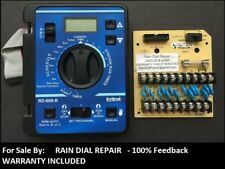 Irritrol Rain Dial Irrigation Timer (BOX ONLY.) SHIPS FAST! Indoor Installation. New, never used. This is in good working condition. All buttons and switches work as they should. Dial works correctly. All functions work correctly. Lightly used in residential setting. We upgraded to a newer system. You get exactly what is seen in the pictures. The Irritrol KD400-INT includes the following Features Have a plot plan?. I can design. Have a technical issue?. I can resolve it. Located outside the United States?. No problem! We are here to exceed your expectations! These were previously installed units. They will have sign of usage. The case may have been previously been painted. They may be faded and weathered. However,they are fully functional and clean. New in the box, Irritrol RD600-INT-R. This model is for interior locations such as a garage. 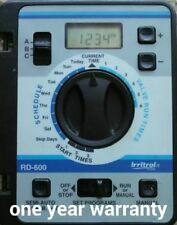 Irritrol SR-1 Pump Start Relay. Condition is New. Shipped with Economy Shipping. No instruction manual included. Rain sensor - Adjustable for amount of precipitation to shut off system. Built-in radios - For easy, wireless installation with less labor than wired systems. Temperature sensor for monitoring air temperature - Shuts system off in cold weather. (The system allows for sensing rain and automatically adjusting irrigation schedule. You know you need one :). It doesn't work with our system. Our loss is your gain. This is a refurbished Hardie/Irritrol electrical board. Sensor hookup with bypass switch compatible with irritrol's Rain Sensor Series Saves water by shutting off the system during rain. THE POWER CORD IS INCLUDED. WE ARE VERY SORRY FOR THIS AND HOPE YOU UNDERSTAND. 6 Station. Self guided programming. Convenient flip-cover protects the large LCD display. The Irritrol KD600-INT includes the following Features Have a plot plan?. I can design. Have a technical issue?. I can resolve it. Located outside the United States?. No problem! We are here to exceed your expectations! 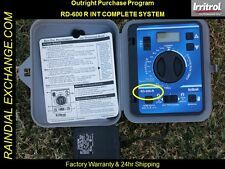 Irrigation Systems Irritrol SR-1 Pump Start Relay. New Original Box. See photo as this is exactly what you will receive. Proper irrigation of lawns and gardens has its challenges, especially for larger areas that are not equipped sufficiently to handle this task. Unpredictable weather (sudden, unexpected rain or overnight freezing, for example) needs to be considered. 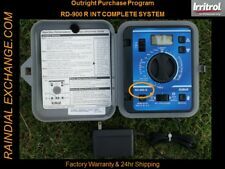 The installation of Irritrol garden watering timers and controllers to the irrigation system can go a long way toward helping residential and commercial customers save time and make sure that areas are watered only when programmed to do so and needed, thus maintaining the health and vitality of the landscape. What is the Irritrol Climate Logic Wireless Weather Sensing System? This unit consists of two components: a wireless transmitting weather sensor for installing outdoors and a receiver module for attaching to the Irritrol controller. This system monitors weather data, transferring this information to the module. This will then, based on the weather, alter the controller's program. This helps to provide water-saving, automatic irrigation control with the use of simple components. Does Irritrol provide a controller for typical residential use? Irritrol features their Kwik Dial Series, a system that combines simple water sprinkler control with a sophisticated controller in a user-friendly way. Scheduling flexibility for water sprinkler control is made possible by automatic, semiautomatic, and manual options for operation. The timer regulates watering intervals and can make subsequent changes to water dispensation based on seasonal adjustments. And the Irritrol controller is available with the optional Climate Logic Weather Sensing System. Is there an Irritrol controller for groundskeepers? Watering days for each program. Configurable master valve type and programmable master valve. Where do homeowners commonly place timers? This is really a matter of personal preference, as long as the unit is well within reach of a power source. People who install timers outside have the convenience of knowing that if a technician needs to service the controller, the owner doesn't have to be there to let them indoors to access the unit. If timers are in view of the yard, it can make it easier to check specific zones or valves. People who choose to put timers indoors may prefer knowing that they always have quick access to the unit. Content provided for informational purposes only. eBay is not affiliated with or endorsed by Irritrol.